Blueberries: Blueberries are high in antioxidants and vitamin C and are readily available frozen, making them an easy addition to a smoothie. Walnuts: Walnuts are chock full of the omega-3 fatty acid ALA, which can be converted to omega-3s DHA and EPA in the body. DHA and EPA are beneficial for brain, heart and eye health and can be consumed directly by eating fatty fish or through fortified foods, beverages or supplements. Look for Organic Valley Omega-3 milk or Ovega-3 vegetarian DHA+EPA supplement. Black Beans: Black beans are extremely versatile. You can put black beans in salsa or make veggie burgers with them. They also keep for a long time and have tons of protein and fiber to spare. 100 Percent Whole Grain Cereal: Get yourself a 100 percent whole grain cereal, fresh fruit and some low-fat milk and you have a healthy breakfast on the table in less than five minutes. If you’re sending the kids on the bus with their breakfast, try Super Squeezies with omega-3 DHA. Peanut Butter: Not only is it delicious, inexpensive and readily available, it’s also loaded with the right kind of vitamins (like vitamin E), fat and protein. It helps to thicken up smoothies, and put it on whole wheat bread for a nostalgically delicious sandwich. 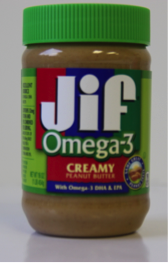 Try Jif peanut butter with Omega-3 DHA & EPA. Chicken Breast: Want meat without the fat and cholesterol that comes along with steak and hamburger? Get yourself some lean chicken breast. It grills up quickly and with just a bit of seasoning, you have a delicious, healthy centerpiece for your dinner. Sweet Potatoes: These are the healthier alternative to potatoes. They’ve got less carbs in them and have been touted as one of the world’s healthiest foods. What foods do you enjoy on a budget?